Have you ever experienced a chain of events, where the dominos start falling, and you just try to keep up? That is the story of this shawl. My daughter got engaged, so I bought a dress to wear at her wedding. The dress is sleeveless, so I wanted a shawl to wear over my shoulders. Not knowing where to find a matching shawl, I decided to weave one. 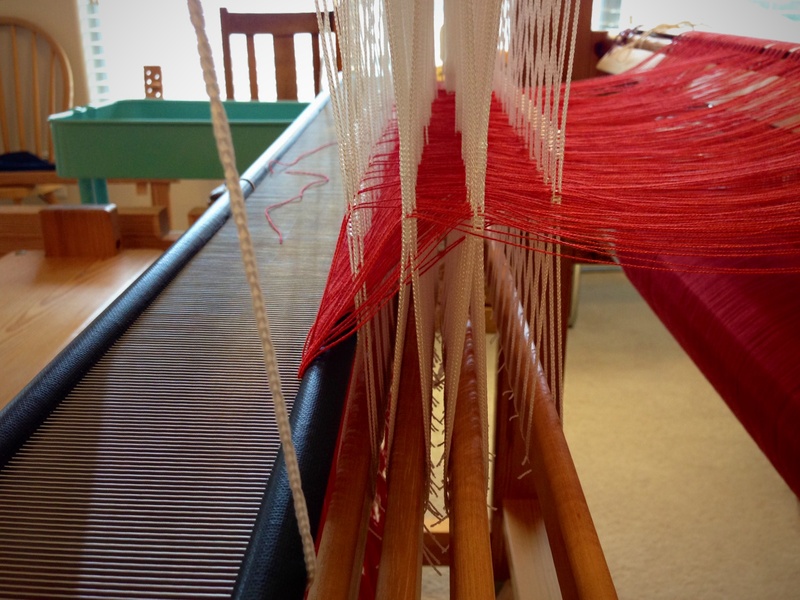 To weave a shawl, I had to finish weaving these towels that were on the loom, plan the draft for a shawl, and order thread. New 10/2 bamboo thread samples added to my thread/yarn record book. 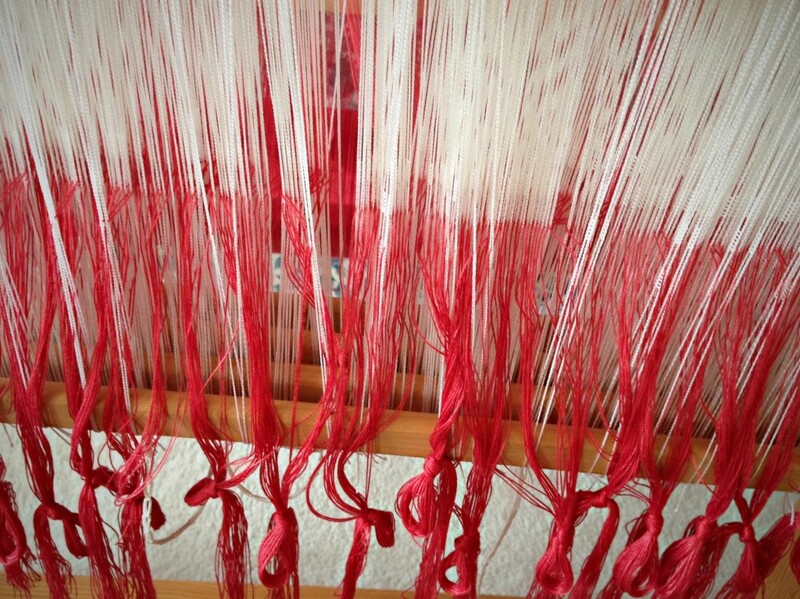 The excitement of dressing the loom, trying out weft color options, weaving the delicate huck lace pattern, twisting fringe, wet finishing the cloth, and waiting for the wet cloth to dry, is all intensified because of the meaning of the event where I will wear the shawl. The shawl, itself, is a minor player that will serve best if it is not even noticed. The attention will be on Melody and Eddie as they pledge their love and faithfulness to each other, embracing companionship for a lifetime. Three weeks to go! Threading heddles for huck lace. Reed is sleyed with two ends per dent in a 12 dent reed, which means the sett is 24 ends per inch. Every thread stands at attention, each in their proper place. Let the weaving begin! 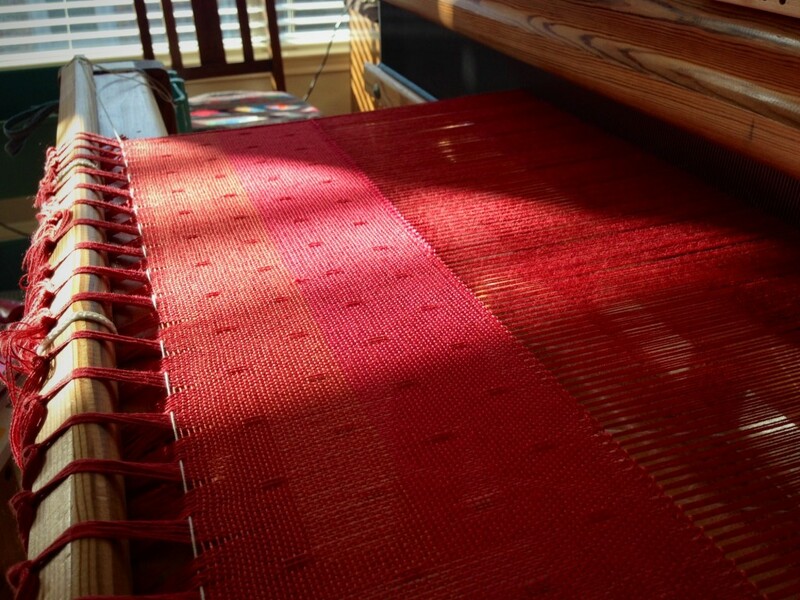 Trying out the weft colors in the late afternoon on the dark coral warp. 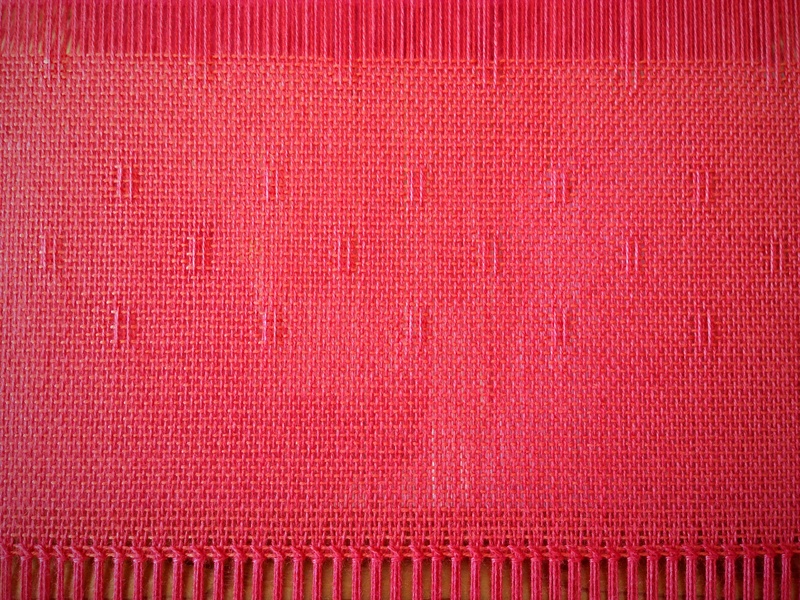 First, coral weft; and then, hot pink weft. 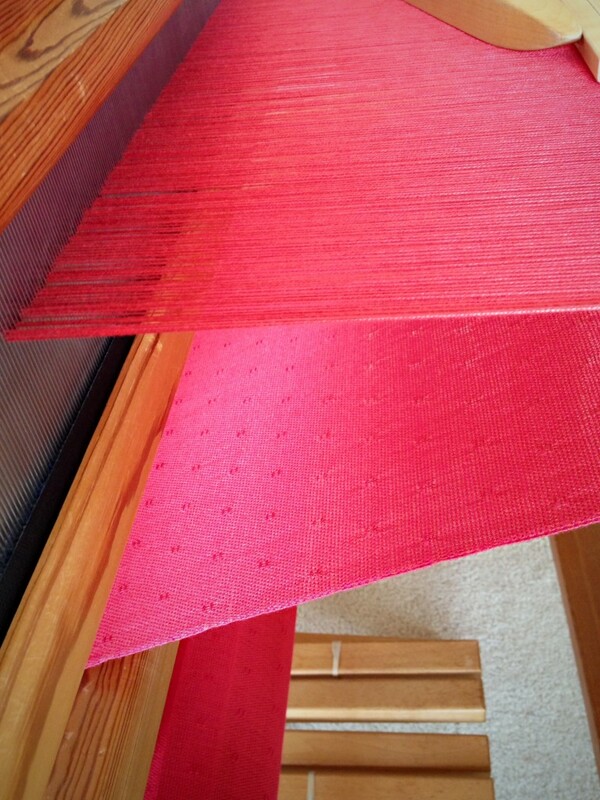 Pink coral shawl was woven first. The hot pink huck lace weft floats are on the back side of the cloth, visible as the cloth angles toward the knee beam. Hemstitching at the beginning of the coral shawl. Notice the subtle border treatment that starts with plain weave and three closer rows of huck lace before the body of the shawl. Twisting groups of warp ends together to create twisted fringe that embellishes the ends of the shawl. There is nothing that makes me more nervous than wet finishing. A mistake at this point can ruin the handwoven masterpiece. 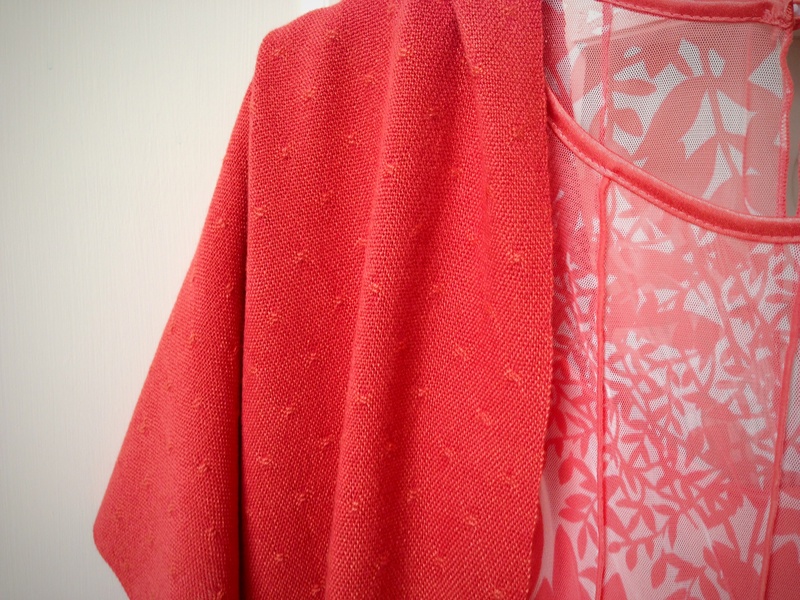 For this reason, I first wet finished the sample piece, and then the pink coral shawl. 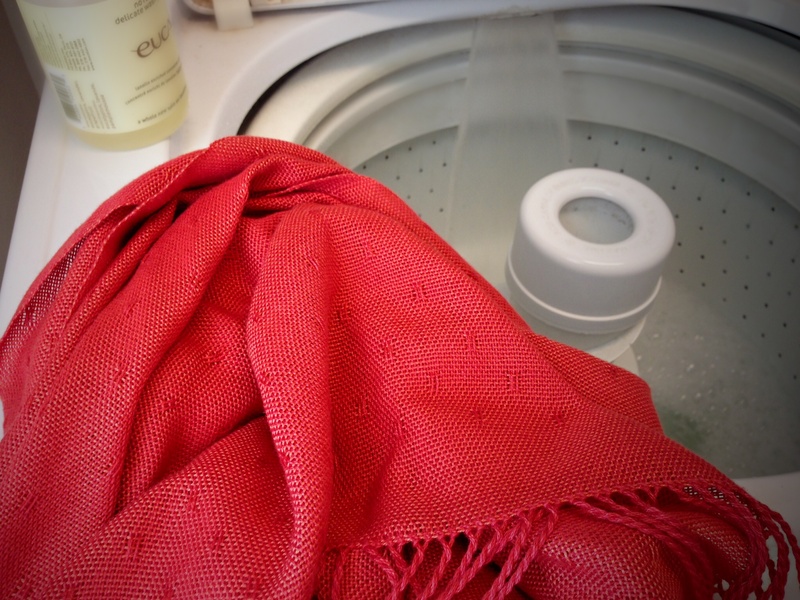 Now, I am confident about throwing the coral shawl into the washing machine with a half-capful of no rinse delicate wash concentrate. 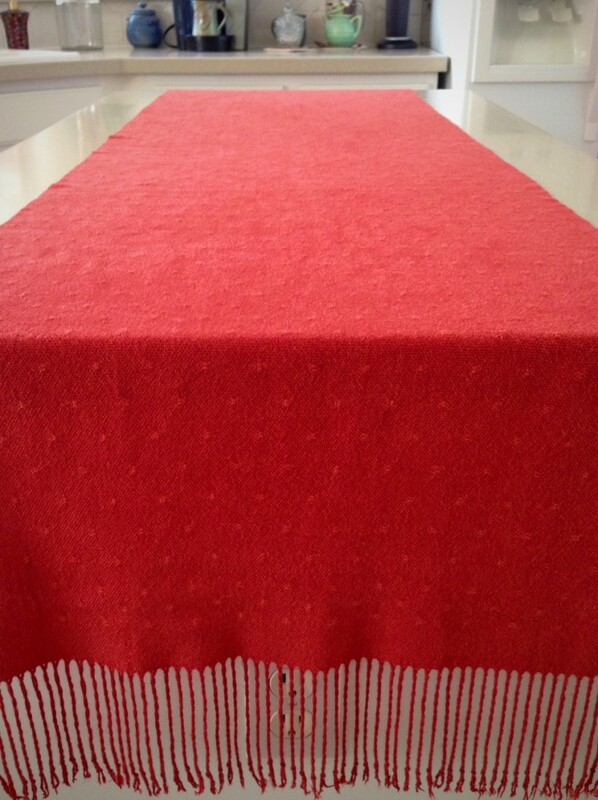 After gently rolling the wet cloth in towels to remove excess water, I lay it out smoothly on my longest countertop, and leave it to dry overnight. 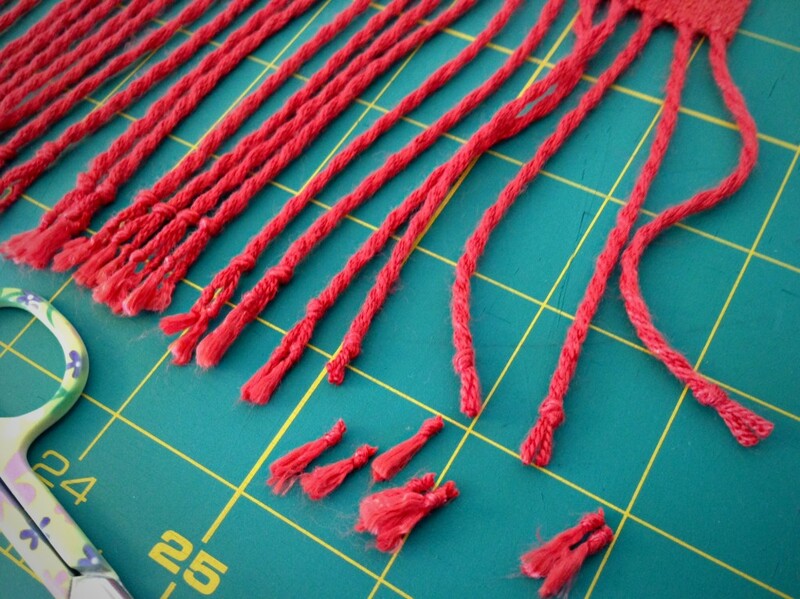 After the cloth is fully dry, knots at the ends of the twisted fringe are trimmed off, removing frayed ends and leaving clean-cut ends. Ready for a special occasion! May those you love know how much you love them. Lovely and a perfect match with your dress! I appreciate your compliment, Diane! I was holding my breath for the final outcome, hoping for a good match. Thankfully, the colors worked. Gorgeous Shawls – and love the one you’re wearing with your beautiful dress. I was really impressed with your yarn swatch book. I just have a bunch of 3 x 5 cards held together with a ring, but yours makes so much more sense. I think I’ll make one for myself over the summer! I know that the wedding is going to be a beautiful affair. Enjoy! Laurie, I love snipping off a meter of any new yarn and putting it in the yarn record book. There’s nothing wrong with 3 x 5 cards – you have a good start! 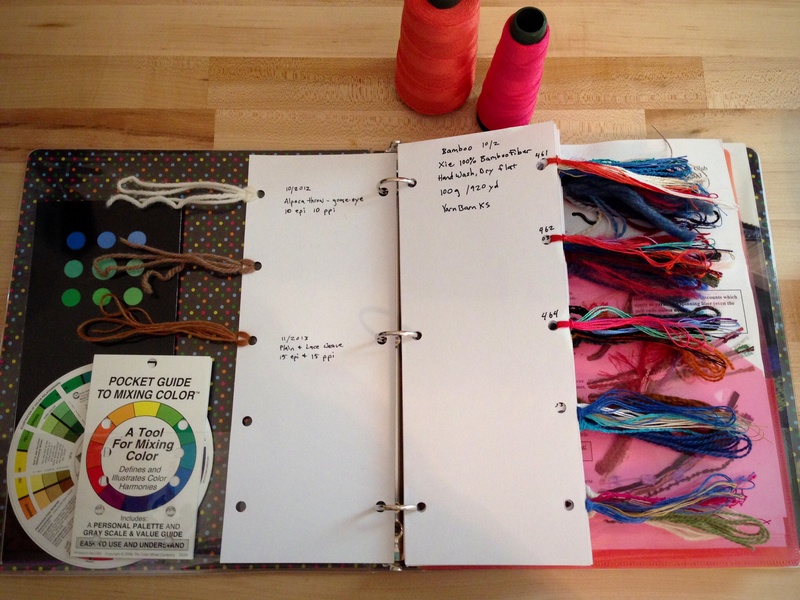 I’ll do a Tools Day post sometime about the yarn record book. Thanks for your blessing and kind words! It’s a good reminder to enjoy the day!! That´s really a wonderful shawl ! Next time I´´ll weave one, I should think about hemstitching. I really understand your nervousness before wet finishing, as I once ruined a big double woven blanket because I didnt try it out with a sample. Oh no! That’s too bad about your double weave blanket. I think everybody has ruined something in the washing machine at least once. I’ve done it! 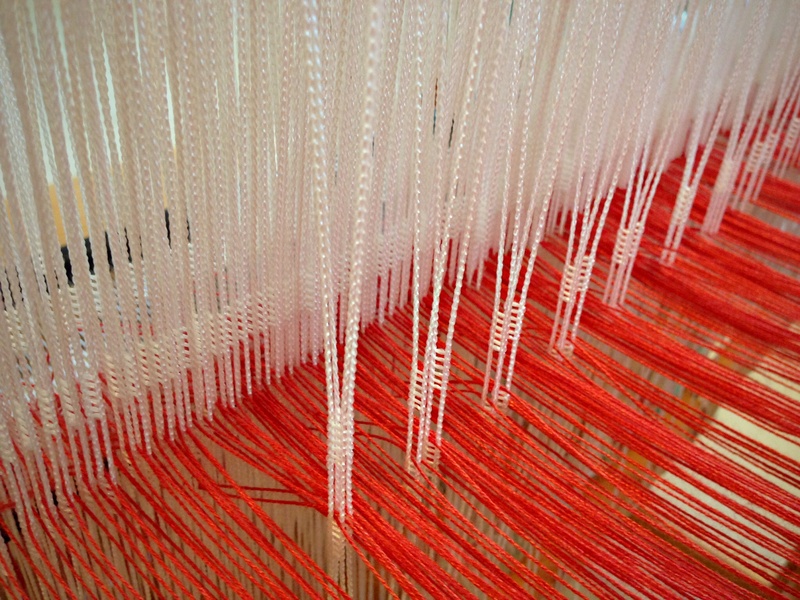 Hemstitching is easy to do on the loom. 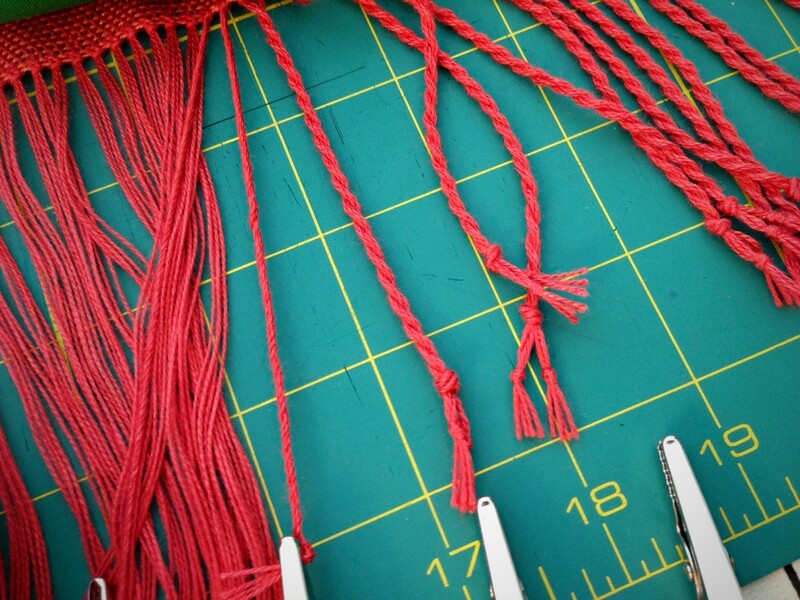 It’s a great edging for anything that has fringe. Wish you a nice weekend, too.